After arriving late and setting up in the dark after football practice, Saturday morning and Blackhawk Farms started quiet. The wind was cool with a touch of dampness in between the morn ing calls of the birds. There was a soft clinking of tools and parts, with the occasional thump and swear as teams started to get karts ready for a day of road racing with the Championship Enduro Series. For our team it was going to be the usual with the additional excitement of the Animal Nationals and the Adam Shartz team races. 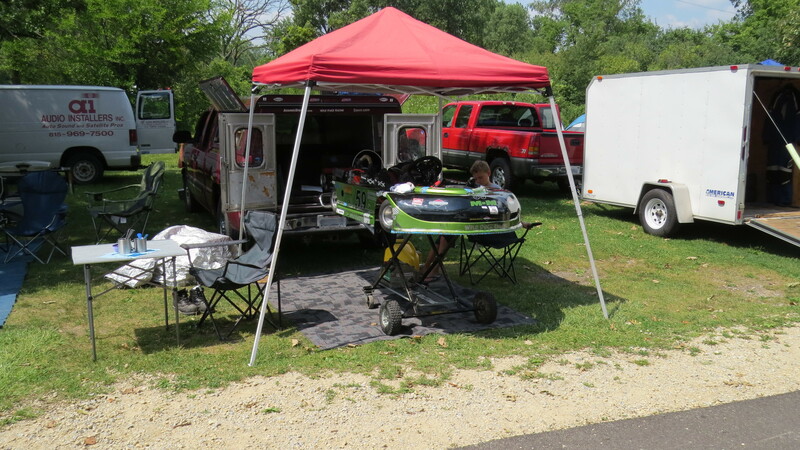 While Jason slept, I set the kart up for the day and tried to put together a plan of attack in my head. I had acquired a larger drive gear so that I could possibly tune the kart to go faster. The first practice went well. I recorded it and wanted to watch it so we could make adjustment in the second and third rounds. Jason did a good job getting around smoothly, but he was grumpy with my suggestions. I had to let it go and let him find his way. Looking at his RPM (revolutions per minute) during his fastest lap he was standing on the gas pedal and braking just enough for the corner. For the rest of the practice sessions I made some gear changes, trying to find that sweet spot between horsepower and speed. During Saturday’s race Jason and Pete were very close. Pete was faster in the straights and Jason was faster in the corners. After about 20 minutes of the 25 minute race, Jason started a pass by drafting another driver while Pete came up on slower traffic. Drafting is the technique of using the slight vacuum created by the driver in front of you to pull you along and go faster then you could by your self. In the next lap Pete passed him back. When you watch the video, pay attention to Jason’s feet. His right foot is hard on the gas while the left is light and gentle as he enters the corners. 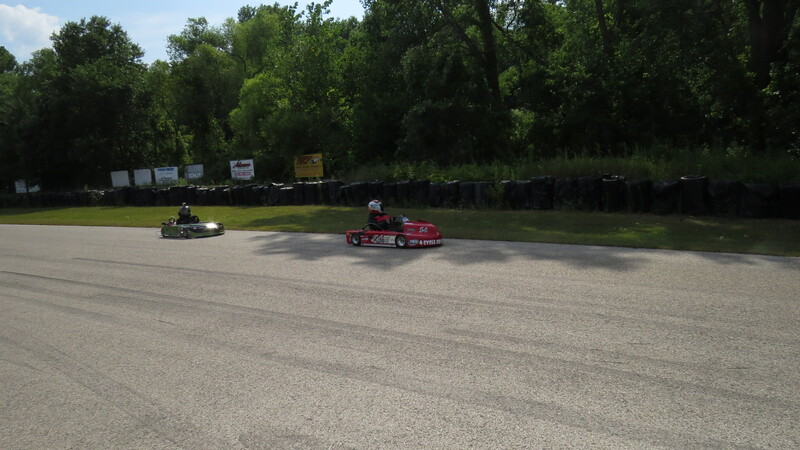 The kart is going as nearly as fast as it can go around the track. It’s up to him to follow the optimal line, and up to me to get the setup just right for those fast laps. Jason’s start to Sunday’s race was pretty aggressive. He jumped to the outside and onto the grass to get by some slower starters but then was trapped by more traffic and hindered by less traction on the grass. The rest of the race was less exciting. Pete had tuned his kart just right and was much faster, pulling away pretty quickly. Jason’s goal for the day was to beat his best time and that he did by nearly a full second putting in a 1:38.827. 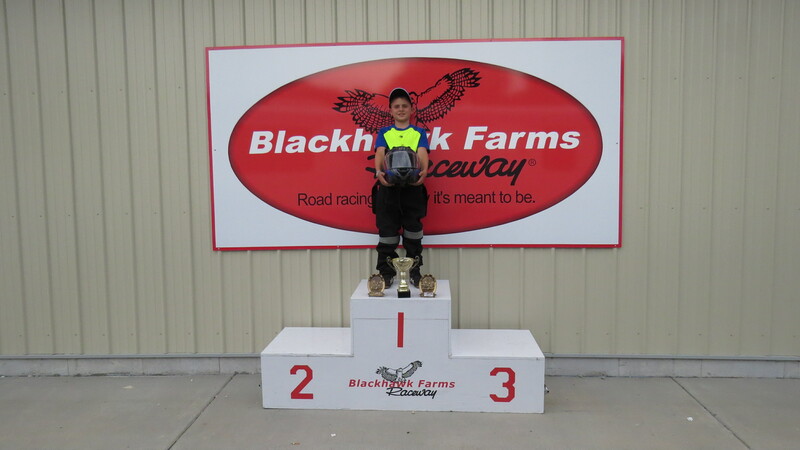 What I like about this accomplishment, is that he hates driving by himself – he loves the challenge of passing any nearby kart – and yet he still got his fastest lap ever. Jason received 2 first place finishers trophies, and a honorary Road Racing National Championship. Next weekend we will be at the Sprint Animal Nationals at Badger where he will be competing in the Briggs Animal Sportsman class. 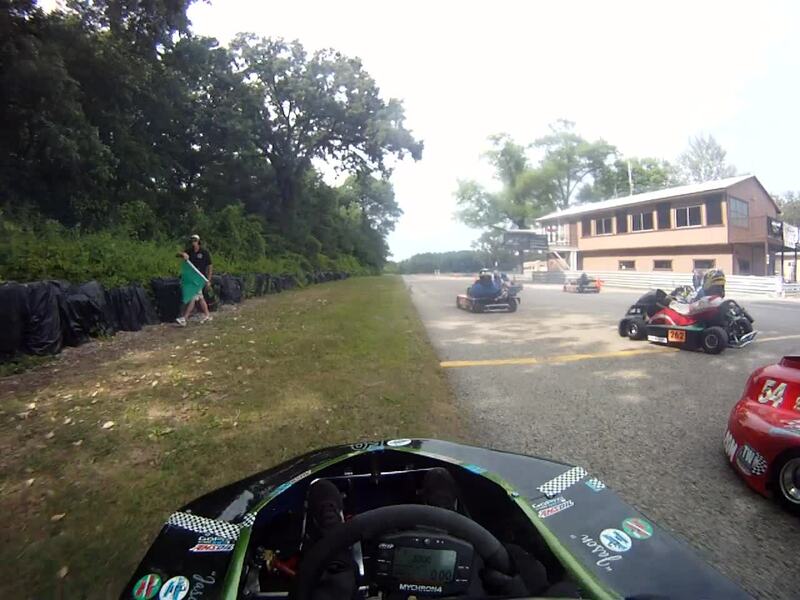 After that, it is back to Road America for the last race of the Mid-American Sprint Series. Thanks to all the folks at Blackhawk Farms, Dave Larson and the Championship Enduro Series team, RedLine Photo for some great pictures, Bob and Regan at 4 Cycle Central for the support and great racing. And to Karen, the newest football parent, thanks for keeping my life interesting.